* Picked up at ALA Midwinter. The murder of a teenage girl at King's Courtyard is big news in the town of Eastport and when Clare is called upon to help out with the investigation by her ex-boyfriend Justin (the mayor's son), she couldn't imagine just how involved she would end up being. 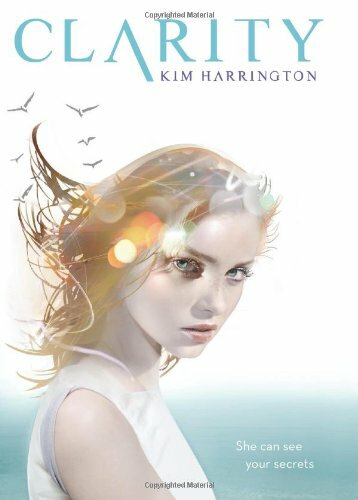 I loved the "voice" that Kim Harrington gave Clare; it made everything easy to read and had me chuckling quietly to myself --in particular when Clare reveals how Perry (her brother) got his scar. Asides from this, I think my favorite minor character had to be Madame Maslov, the new mystic in town who, apparently, can see into the future. Although her role was minor, it could be argued that her role was terribly important and I'm secretly hoping to see her again in Perception (book two, which should come out in March of 2012). And then, there are the boys. First off, we have Perry, Clare's brother, who is quite popular amongst the ladies and a suspect in the murder case. He starts off strong, gets a bit weak in the middle of Clarity and then finishes off rather nicely. Then there's Justin Spellman, the mayor's son. He's Clarity's ex-boyfriend and someone that she's not terribly keen to be around after a certain incident. More importantly, he still has feelings for Clare and perhaps, she has some for him as well. Lastly, there's Gabriel Toscano who has recently moved to Eastport from New York with his father, the town's new detective. He's a skeptic and Clare can't help but find him interesting. On top of this, he has a rather interesting tattoo--not for its design, but for what it says. My personal pick for Clare? I'm rooting for Justin because he does seem genuinely sorry and well, he seems like a really sweet guy! Although the supernatural/paranormal elements help push the story along, the mystery of the murder is what really propels the story along. I won't tell you who the murderer is, although I will say that the person responsible for the murder would not have been my first guess--nor my second. With that said, I'd definitely recommend Clarity to you if you like mysteries with a paranormal flair!